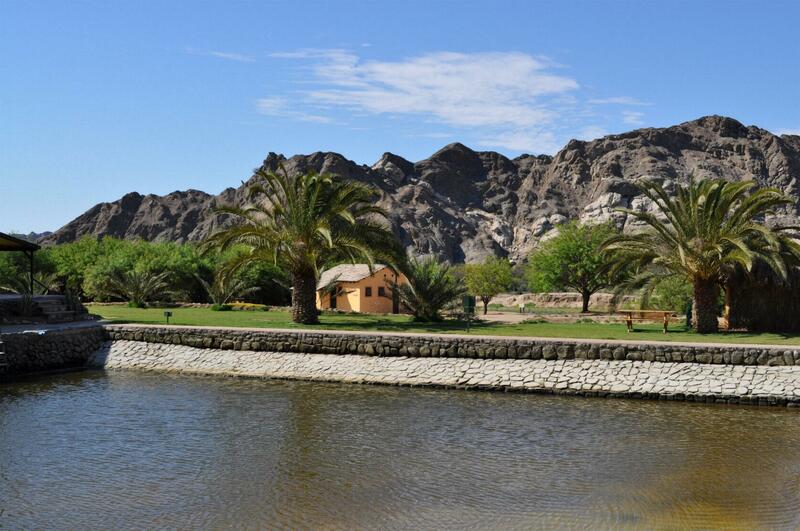 Goanikontes Oasis Rest Camp is located in Moon Valley amid Namib Naukluft and Dorob National Parks in vicinity of coastal town of Swakopmund. The camp offers: restaurant, farm house verandah, home baked cake and coffee, bungalows and chalets (with barbecue facilities), camping sites (braai places, hot/cold water, showers and toilets), swimming dam and lapa. 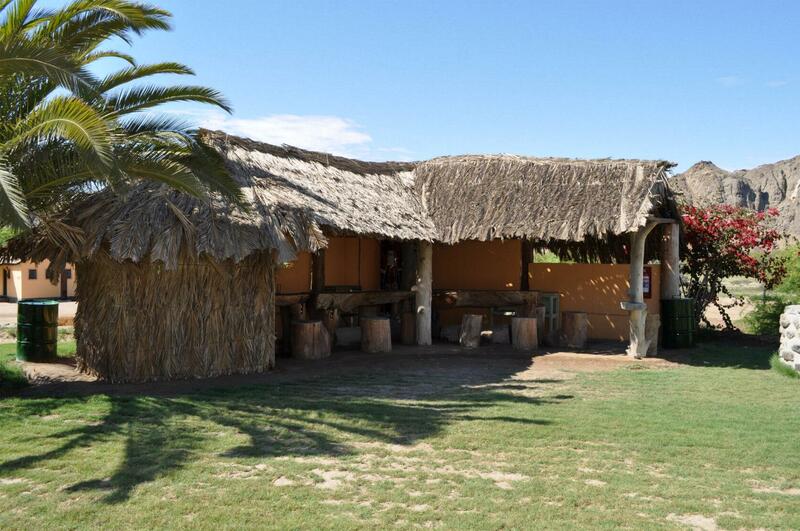 The camp is ideal venue for functions and festivities. Goanikontes is situated in a lunar-like landscape, in the Namib-Naukluft National park It is an ideal location to visit the Moon Landscape, Namib-Naukluft Park, Sossusvlei and Sesriem, Welwitschia Mirabilis, Flintstone Caves, Swakop River, Weitzenberg Ruins - Hagenbeck Ostrich Farm founded in 1911. Goanikontes Oasis is hidden between the mountains of the Moon Landscape. Since prehistoric days it was always a place, where people from different tribes took a rest. European and South African settlers called it "Baiweg" - "Bay road". This was known as the ancient track from Walvis Bay and Swakopmund to Windhoek which trailed through Goanikontes. Here the settlers fed their oxen and prepared them to be sold. The name Goanikontes is of Nama origin and means "The place where you can remove your fur coat". 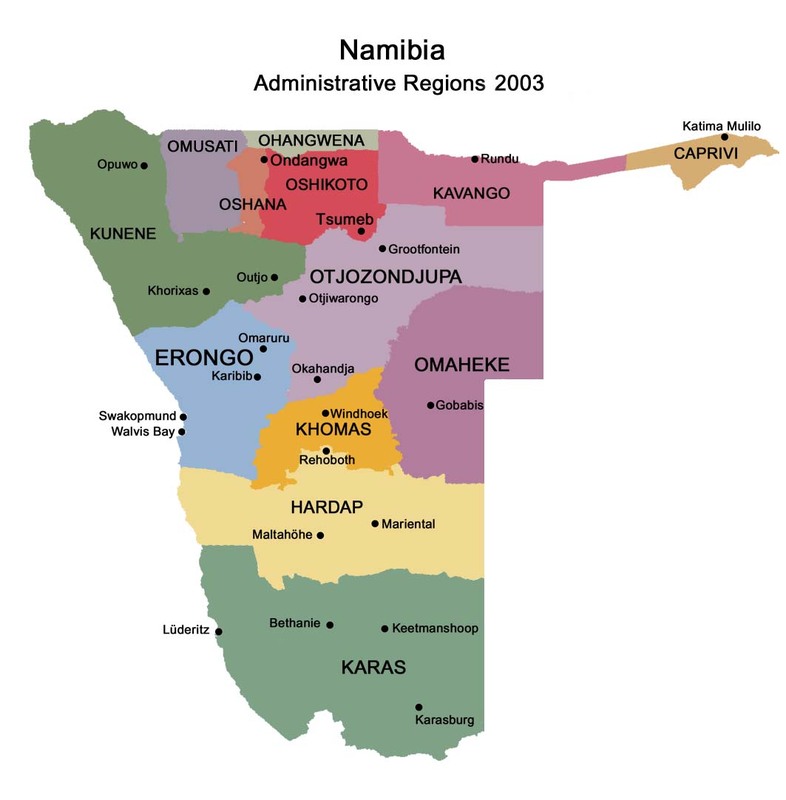 Herero people moved to this area in 1750 from the settlement Otjimbingwe in central Namibia. The nomadic Namas also inhabited this area in the late 1750's. In 1849 the first white settlers known as the Dixon family inhabited the oasis. 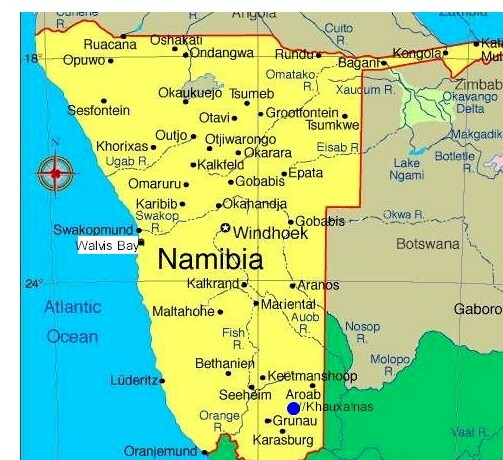 Peter Dixon and Thomas Morris were the founders of a company at Walvis Bay which traded cattle from Herero tribes and shipped them to St. Helena. Goanikontes was the ideal place for cattle posts because, though in the desert, it had enough water and fertile soil. In early colonial days Goanikontes was a residential settlement with units ranging from 7 to 160 hectares. From 1903 to 1906 cattle breeders and crop farmers inhabited the oasis region. 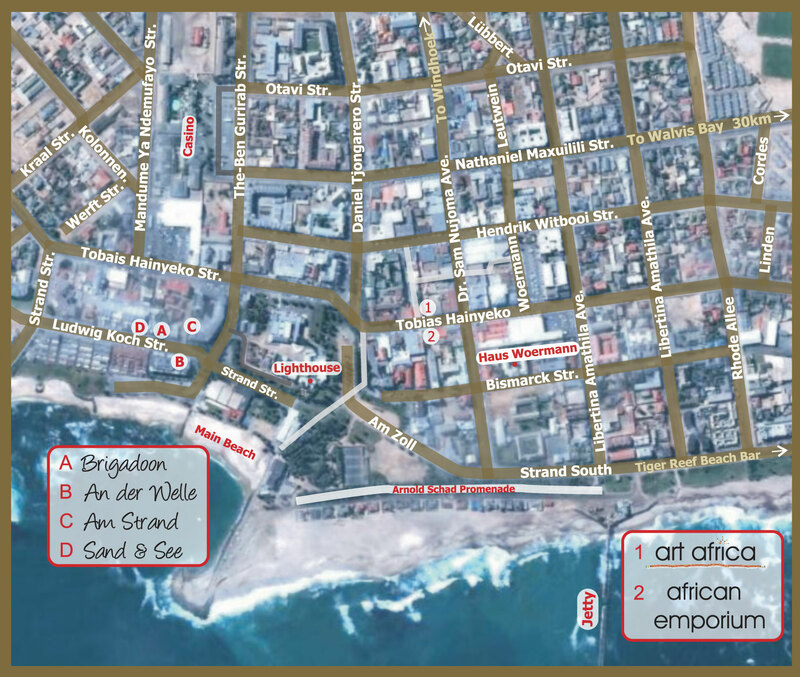 In 1910 the farmers Hrabovsky and Wilhelm Brock cultivated vegetables for sale in Swakopmund and Walvis Bay. Wilhelm Brock was one of the managers of the well known Woermann Brock Trading Company which is now one of the largest in Namibia. Nowadays Goanikontes is rich with legends and stories attracting tourists from all over the world. Igloo-shaped houses provide accommodation with a traditional flair, simple yet clean and tidy. Each igloo is equipped with outside barbecue facilities and a picnic table, where guests can relax and enjoy the stunning views over the valley. The new owner Winfred Metzger tries to keep the old legends alive by serving tea and cake on Sundays, following the tradition of early days. The restaurant was established in the historical farmhouse built by Hrabovsky in 1903. Picnic sites are available (shaded, barbecue facilities).